Happy Hanukkah from Brooklyn! Card design by Cheryl Berkowitz, via Subway Art Blog. Tags: transportation, Judaism, religion, seasonal. America’s war for indpendence began on April 19, 1775, when the first shots were fired at Lexington and Concord in Massachusetts. Tags: USA, historical, mapping, National Geographic. A new analysis shows when summer reaches peak heat across the U.S. Tags: physical, weather and climate, seasonal. 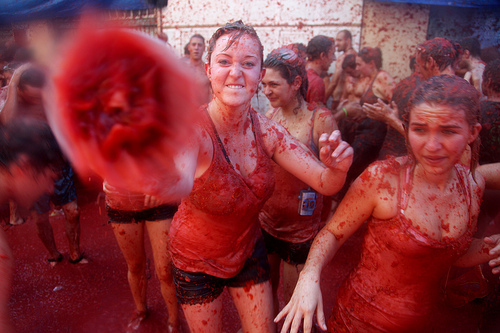 La Tomatina is a festival that is held in the Valencian town of Bunol, located inland from the Mediterranean Sea, that brings together thousands of people for one big tomato fight – purely for fun! Notice the signs for storing backpacks and luggage that are now pastered with tomatoes on the store in the background of the image. These hastily-composed, informal signs are written in three languages (Spanish, English and Japanese). What does this tell us about the festival? Also, notice how the comments section revolves around the concepts of waste, poverty and consumption. Tags: Europe, food, tourism, seasonal, culture, unit 3 culture, consumption.